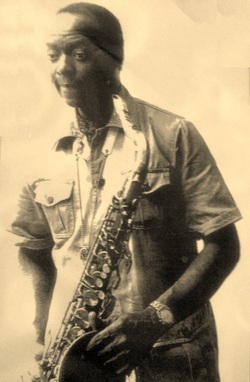 "Drawn to wind instruments, Atkinson received his first saxophone from his mother, who purchased it for $16. She asked her friend, Clifford Johnson, who played with the Noble-Csysills Band before retiring, if he'd teach Punchy to play. Atkinson started performing at the Cosmopolitan when he was around 15. 'The police wouldn't bother me, even though they knew I was underage- because they knew I sat in with the Curtis Purnel Group- one of the greatest sax players to hit Akron,' he explains. Around 1955, Atkinson called Champaign-Urbana home where he played in a trio with pianist Joe Bradley and Massillon drummer William "Demon" Evans. The group featured an improvisationial style. 'We knew each other so well that we could anticipate exactly what the others would play,' Atkinson says. Then came the highlight of Atkinson's career: He went on the road with well-known jazz guitarist Wes Montgomery. 'He was a great musician, a great human being, and everybody loved him," Atkinson says. After about a year and a half of touring with Montgomery, Atkinson returned home to Akron. 'I promised Wes to return. But sadly, he passed on before I could rejoin him,' he says. " -Excerpts from an article titled "Hot Jazz on Howard Street" by Bill Van Nostran in Akron Life and Leisure, July 2005.